Paccar/ KW/ Peterbilt have respectively had their own general cab design since the 30s. 350 conventional and bubblenose cabovers utilized a common cab. Virtually every Peterbilt from the mid 70s on with a hood has used a varitiation of the unilite cab, as has almost every KW with a hood even before the bulkhead door cabs. In fact, most manufacturers have followed that design habit since the 50s. It's nothing new. It's just the new cab superstructure. If there is any cab that is, at its core, outdated, it's the International cab. I guess this is what they call vertical integration. All the truck builders will have one cab, 10 hoods and trim packages, with FA or SA front axle and everything manufactured in house and shared across their entire lines. At least you'll have a few options left when ordering a new truck. 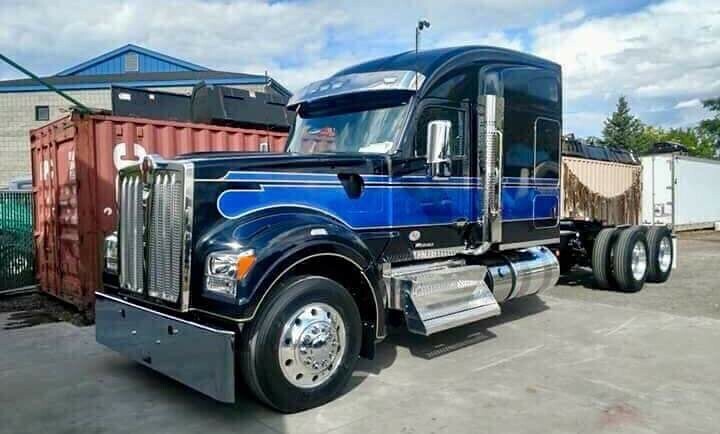 Daimler, Paccar, Volvo, International, trim package 1 2 or 3, the color, Cummins engine, bunk size, regular or heavy spec, and that's about it! twenty seemingly identical white trucks and one blue one that stood out like a sore thumb. I'll take the blue one please! Seeing and reading this makes me even more thankful I ordered the new tractor I just did in July. I already knew I was ordering one of the very last of an era, but seeing Paccar step away from a legendary product is a real paradigm shift. All they did was push more towards automated manufacturing and vertically integrated cookie cutter style manufacturing. Finding a manufacturer that would build what I wanted was interesting, but one came thru with flying colors. The others wouldn't touch it. Can't wait until May/June 2019! Yes International did introduce a new cab around 2008. I can't remember if the medium duty cab is exactly the same - I know that the dash is different. Having driven both a 2003 9400i, and it's effective successor, a 2013 Prostar... their "new cab" was hardly a major change. The Prostar wasn't the 9400's successor, it was a parallel aero model. It still carries through to today in the 9900 model. I'm wrong, I screwed up thinking of the 9300. Troy is correct. Was 2007 the last year for the 9400 or was 2009 the last year for the 9400? If that's it, I ain't a fan. This young man is personally not a fan of the newer kenworth models, though the T680 cab has a certain appeal to it in my opinion as an aero truck, but the smoother W900/T800 cab design is not my cup of tea. While I will admit they look cool, I doubt that they'll last longer than a million miles with all the plastic in them. Never been one for the aero trucks in the first place. Doesn't help that night and day all I look at are older trucks . I kind of think Western Star when I see that one. The latest news from Kenworth's Facebook page is that it will be called the W990 and will be officially unveiled on September 28th.